The Orgone Biomat™ is a therapeutic self-care tool people can use to support their body’s natural healing process during sleep. It is our newest product and combines the comfort of the Quantum Energy Pad with the therapeutic benefits of the original Biomat®. During sleep, our body completes restorative and regenerative processes that are very important to balanced, successful, and happy living. 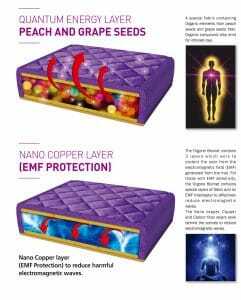 Orgone Biomat™ produce far infrared rays and negative ions which are known to deeply penetrate body tissue and have a profound effect at the cellular level and improve effectiveness and efficiency of the body’s natural sleep process. Far infrared energy is invisible light which occurs just to the right of red on the rainbow spectrum of light. Far infrared energy deeply penetrates bodily tissues to provide deep radiant heat therapy. Far infrared has been used for healing and protecting the human body since our beginnings. Long before the current scientific evidence emerged about the benefits of far infrared energy people used it in the form of sunlight or hot stone therapy to preserve their health and heal minor injuries and illness. 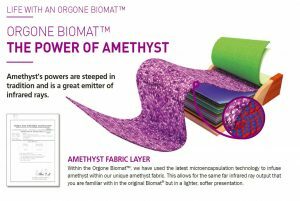 Biomat® Mini brings centuries of healing knowledge into the modern world. Learn more about far infrared.